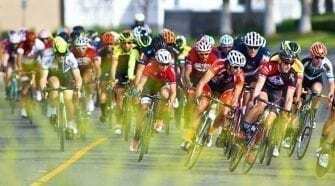 Van Garderen Clinches Overall, Sagan Takes Santa Rosa Finish - SoCalCycling.com - Southern California, Cycling, Cycling News, Amgen Tour of California, Bicycle Racing, Fun Rides, Cycling Event Schedules, Mountain Biking, Cyclocross, Cycling Photos, Cycling Videos, Interviews, Product Reviews. After eight epic days of racing along nearly 750 miles of California’s most iconic roadways, highways and coastlines, BMC Racing Team’s Tejay van Garderen (Boulder, Colo.) sealed his first major stage race win at the 2013 Amgen Tour of California, which concluded today in Santa Rosa, Calif.
Cannondale Pro Cycling’s Peter Sagan outsprinted the field to win the race’s final stage, a 80.7-mile jaunt that took cyclists from San Francisco across the Golden Gate Bridge for the only the second time in race history, to the overall finish in the cycling mecca of Santa Rosa. The race’s final stage aired live on NBC. It was Sagan’s 10th career Amgen Tour of California stage win, the most of anyone who has ridden in America’s Greatest Race. A sea of fans turned out for the BMC Racing Team’s homecoming, which included overall team honors in this year’s race. Team leader van Garderen was named the Best Young Rider in the 2011 Amgen Tour of California and placed fourth overall last year, but today marked his first career overall title with a final time of 29:43:00. 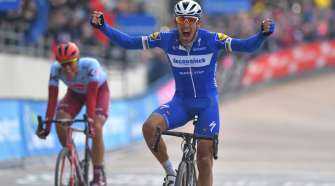 Stage winners were equal parts sprinters and climbers this year, as racers had to contend with several game-changing climbs that totaled a race record of 60,000 feet. Second for the overall finish was 2010 Amgen Tour of California champion Michael Rogers (AUS) of Team Saxo-Tinkoff (1:47), followed by Team Jamis-Hagens Berman’s Janier Alexis Acevedo (COL), whose determined climbs in Stages 2 and 7 earned him the precious seconds he needed for a podium finish (+3:26). Acevedo wore the yellow jersey for the first half of the race, and after getting caught out by a breakaway in Stage 5, he battled his way back to podium position yesterday to end the race just ahead of fourth- and fifth-place finishers Mathias Frank (SUI) of BMC Racing Team (+3:32) and Cameron Meyer (AUS) of ORICA GreenEDGE (+3:33). Proving on home turf they are a force to be reckoned with, American cyclists took four of the top 10 finishes overall. Earlier in today’s stage, a three-man breakaway escaped from the peloton around mile four and held their advantage until 10 miles to the finish, when Vacansoleil-DCM Pro Cycling Team’s Thomas De Gendt (BEL), the third-place finisher in last year’s Giro d’Italia, fell back into the pack. The remaining two riders, Bontrager Cycling Team’s Antoine Duchesne (Petaluma, Calif.) and Santa Rosa-based BISSELL Pro Cycling’s Jason McCartney (Coralville, Iowa) kept their lead until just before the finishing circuits. McCartney, the second of the three to rejoin the peloton, was awarded the Amgen Breakaway from Cancer® Most Courageous Rider Jersey for his ride out front today. McCartney is the only cyclist of the 127 who began this year’s competition who has started and finished in all eight editions of the Amgen Tour of California. McCartney’s teammate on BISSELL Pro Cycling, Carter Jones (Boulder, Colo.), cinched the Nissan King of the Mountain Jersey competition yesterday, having worn the polka-dotted jersey every day since the race began; and Bontrager Cycling Team’s 21-year-old Lawson Craddock (Austin, Texas) came away with the Crunchies Best Young Rider Jersey, which he has worn since Stage 3. 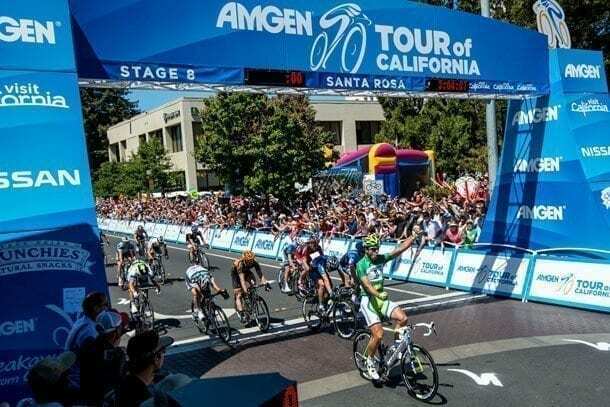 The eighth annual Amgen Tour of California from May 12-19 ran south to north for the first time this year, covering nearly 750 miles of California’s most scenic highways, roadways and coastlines. With one of the most difficult courses in race history, 127 riders on 16 teams (111 remained in the final day of racing) battled through 12 Host Cities and a record 60,000 feet of climbing, including an epic summit finish atop Mt. Diablo yesterday.